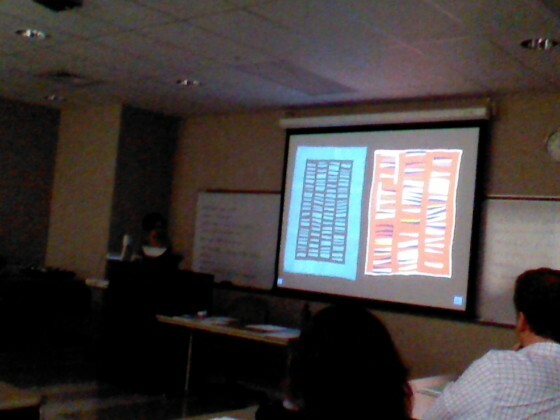 Day one of the Amish technology conference at Elizabethtown College. 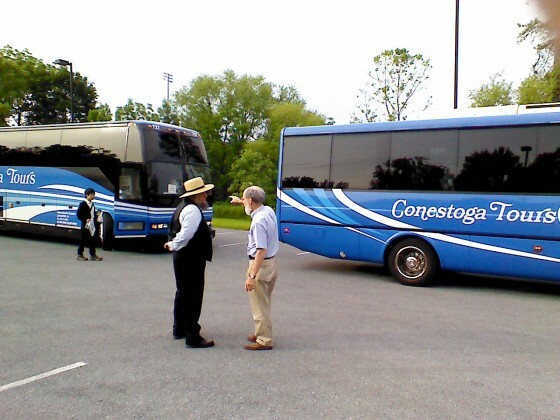 This morning I drove an Amish friend who is helping to leading the Ag and Business tour a tour to the Young Center. The tour will take in a number of Amish business including a hydroponics produce grower and a popcorn place. The second tour will focus on health and medical related destinations including a mobile dentist catering to Plain people. 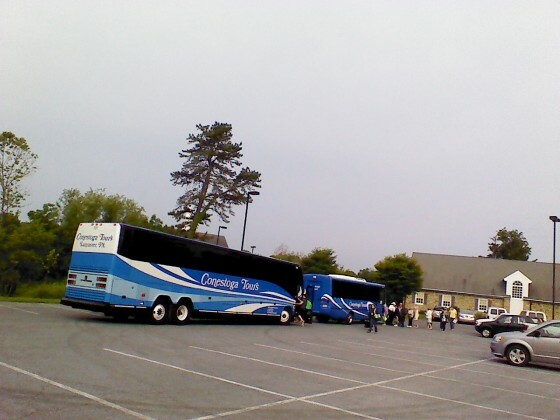 Both buses were ready send waiting when we arrived and the two groups departed without a hitch. Registration begins at 10:30. The conference starts at 1:00 pm. I have heard that close to 300 will attend over the three days. I’ve been poring over the schedule to decide which sessions to attend. With around 100 speakers this is like an all-you-can-eat buffet, but you’ve just got the one stomach. 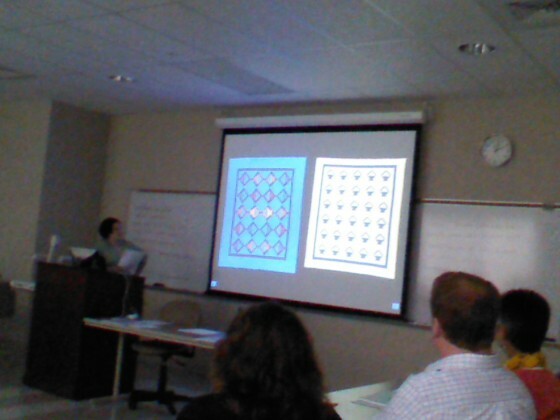 I plan to attend Janneken Smucker’s Amish quilt seminar in the first session but not sure after that. I met Janneken at the previous Young Center Amish conference (Forgiveness Conference in 2011) and have read a number of her writings on quilts (here is one on the development of Amish quilts in Kansas). Later tonight we’ll have the plenary lecture delivered by Kevin Kelly, co-founder of Wired magazine, and author of What Technology Wants, which contains a chapter entitled “Lessons of Amish Hackers”. Great book which made me think about technology in a different way. Here is one of Kelly’s blog posts on the topic of Amish hackers. I’ll be checking back in with updates and more photos throughout the day and conference. 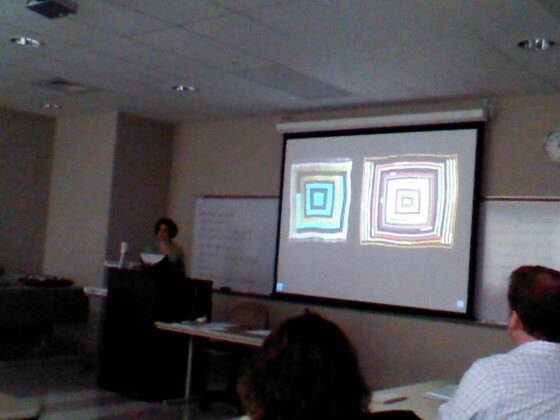 She also made some interesting comparisons between Amish quilts and those created in the African-American community at Gee’s Bend, Alabama. Much more could be said but this will have to do for now because it’s dinner time here at the Elizabethtown student center, and I’m getting hit in the head with flying Amish hats so time to answer the call! you’re having a blast! It’s right up your alley. I would love to be attending some of the programs. It was great to have you play along during the Amish Quilts seminar, Erik! Erik, you need to learn to duck when those hats come flying, *grins* so then you can send them sailing right back at their owners! When’s the next Amish Conference? Will it be held at the same place? The topics covered are broad and wonderful to contemplate. Sandra, I don’t have any info on upcoming Amish-themed conferences. These aren’t annual events rather they have been special occasions based around a particular theme (tech this time, forgiveness in 2011). I’ll be sure to share it if and when a new conference is announced. Kevin Kelly’s talk (by live video) had some humorous moments. Several times his PowerPoint or presentation became “stuck,” and he humbly asked the technicians to come fix it. 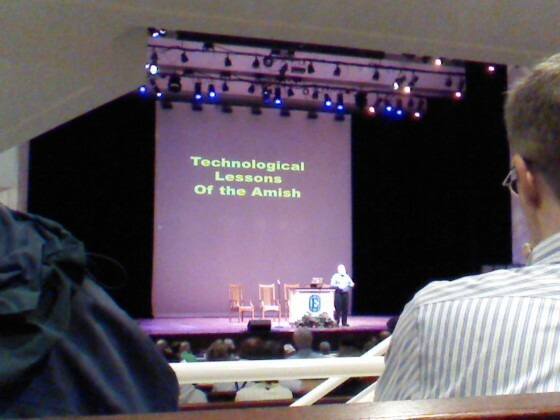 When you thought about it, that this was at the conference titled, “Amish America: Plain Technology in a Cyber World,” plus Kevin was giving a talk about technological lessons, and his technology was not working, it made me chuckle. It was a treat to hear Donald Kraybill speak, and to see his smiles! Which technology could you give up today?